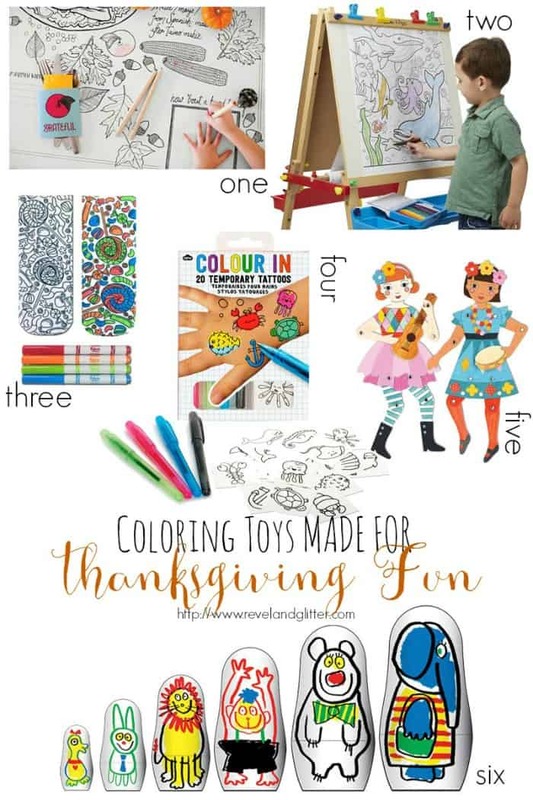 This post is courtesy of our contributor Dawn of Revel & Glitter…Thanksgiving is next week in the US and if you are like me, you have to keep kids of all ages busy while waiting for dinner. Adult coloring is still on the rise, so I’m bringing it back to where it all began with these six coloring toys that are perfect for tapping into the creative side of the younger set. These items are guaranteed to make even the grownups join in on the fun. one. Caravan Shoppe’s The Draw Together Thanksgiving Set will make your Thanksgiving party decorating as easy as can be! Their illustrations bring fun and whimsy to your table while fun prompts on the placemats and table covering will make conversation easy. two. Roll out 40 feet of coloring fun with this unique animal-inspired easel paper from Melissa & Doug. The roll fits standard standing easels, or can be rolled out on a flat surface so multiple artists can color at once! three. Crayola’s Color-In Socks from Living Royal come in fun holiday designs from Candy Lane and Letter To Santa to year-round designs like Floral and Snack Attack. Let kids color in their own pair and wear them around as take home favors. The group photo of all their feet will be priceless! four. Become your own tattoo artist with special pens that let you color them in any which way you want with Colour In temporary tattoos from Fat Brain Toys! five. Invite guests to color Petit Collage’s articulated paper dolls, attach the arms and legs with provided metal brads and make them move! At 8″ tall when finished, they will make a great display for Thanksgiving dinner and beyond. six. Another gem from Fat Brain Toys, this twist on traditional matryoshka dolls uses dry-erase markers for endless design possibilities and wipes clean for a whole new design. Need more Thanksgiving inspiration for kids? Check out another of my Moms & Munchkins posts, How To Create A Thanksgiving Table! 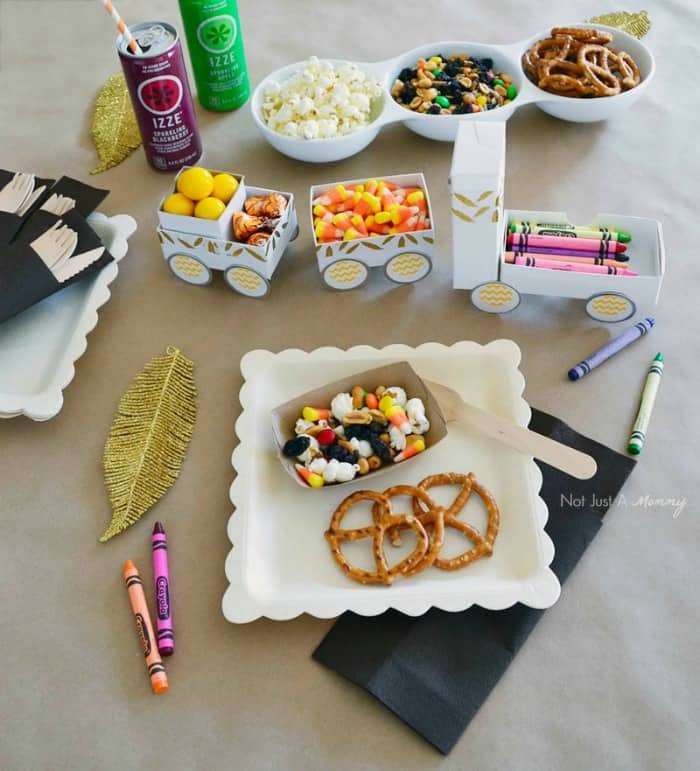 I’ll show you how to make a treat train with candy boxes and share other fabulous tips for entertaining young guests.